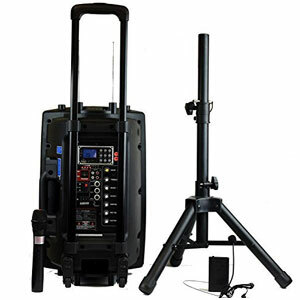 Small, portable PA systems are a vital tool for any gigging musician or touring speaker. Performers need to project their voices and music to the whole room via a manageable system. 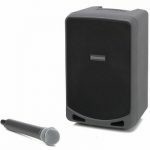 Wireless PA systems are appealing because of the lack of cables, but some models are better then others. What should we look out for with a top rated wireless PA system. 1) Bose S1 Pro Multi-Position PA System. 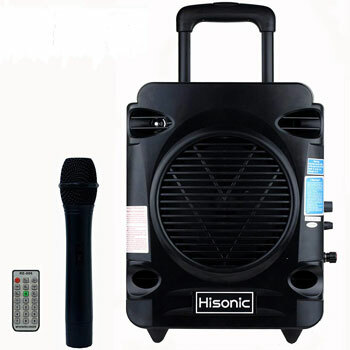 3) Hisonic HS700 True RMS PA System. 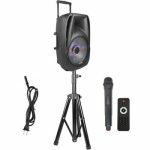 6) PRORECK FREEDOM 15 Rechargeable Powered DJ/PA Speaker System. The most important difference with these wireless systems is of course the use of the battery over mains power. Therefore, buyers need to look at the type of battery use, the lifespan between charges, the method of charging and time taken to reach full charge. Extra details like status indicators can help too. Then the device needs all of the same benefits in the sound quality, projection and ease of use as any other model. Can users carry it on stage with ease? What inputs are on offer? What is the optimal room capacity. 6 of the best wireless PA systems to consider. The first of these models comes from a well-known name in the world of PA systems and musical equipment. This Bose S1 Pro model has a rechargeable Lithium-ion battery for “completely wireless use for hours”. One user reports playing with this PA speaker for around 4 hours with no sign of it needing to recharge. 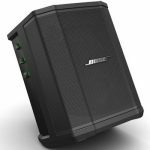 The wireless technology with this Bose PA system also continues with the Bluetooth streaming for feeds from mobile devices. This is a helpful tool on an otherwise stripped-back system. Bose are also proud of their size to performance ratio, as there is is a pretty strong sound from such a compact system. This system has a 3-channel mixer and ToneMatch tech for guitars. It can offer clarity from different mounting positions and is light enough to carry thanks to the 15lb weight and carry handle. In fact, many users are surprised at the clarity and quality on offer here. This rechargeable portable Samson PA system is another one that gets rid of the cables completely. There is no mains power application here, just an internal rechargeable battery that is set to last for as much as 20 hours. This is plenty of time for outdoor parties as well as gigs. Then there is the wireless microphone and the wireless Bluetooth connection for mobile devices. This lack of cables frees up space and makes the system a little less complicated to set up. Alternatively, users can plug in lines to other inputs and instruments via the Aux or USB port. The speaker itself has a nice all-in-one design for portability. This includes the 2-way speaker, 6’’ woofer, Class D amplifier and the 4-channel mixer. It is a nice, clear sound system for medium sized audiences – nothing special, but a good entry point into wireless systems. This Hisonic HS700 PA system has a little more going on in the package and design than the two top rated wireless Pa system products above. To begin with, the speaker is built into a much more portable case design with the telescoping handle and wheels. This case doesn’t add much to the total 8lb weight. Then there are the accessories, such as the belt pack transmitter, the wireless microphone, headset microphone and remote control. There is therefore the sense that this is best suited to motivational speaker and lecturers than musicians. The 75w speaker should be fine for small rooms and the rechargeable Lithium-ion battery pack should last around 8 to 10 hours. Again, this is more than enough for solo users travelling between speaking engagements. Add in the plug-n-play nature of the all in one sound system and this should be user-friendly enough for first time users. If the Hisonic product above was all about speaking engagements and clear sound, this one is all about blasting music out to a party. The battery life isn’t the best on this device, not when compared to other models in this list. But, that 5 hour life is understandable when considering all the functions and the purpose of the system. There are lots of different input available with this STARQUEEN SQ-F19 Portable Bluetooth PA system, including SD cards, guitar ports and Bluetooth streaming. There are also extra features with the mic priority system and the LED lights on the speaker. There is a lot going on here to make this PA sound system appeal to party hosts. The power of the speaker and 15’’ woofer are also a benefit here. This system has plenty of reach and volume to satisfy larger gatherings of people. The portable suitcase design finishes everything off nicely. 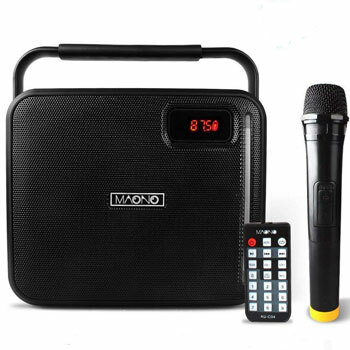 The clue to the purpose of this Maono PK-08 PA system lies in the inclusion of the wireless karaoke microphone and kids app. This is meant to be a fun tool for kids parties and karaoke sessions rather than anything more substantial. There are lots of other inputs for a musical backing track to these sessions, from the USB and aux input to the Bluetooth streaming. But, the 20w speaker and 6.5’’ woofer can only do so much. The optimal room capacity here is around 150 people. The rechargeable battery system in this portable PA system is actually a little more interesting than the others, despite this low-end specification. 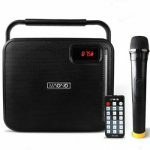 There are up to 6 hours of battery life for the karaoke system and 3 hours non-stop musical playback. There is also a power bank function to charge a phone or tablet. This isn’t the most professional system around, but it still has its uses. The final model in this list is this large model from Proreck. The most obvious difference with this system is the reason for the rechargeable battery. The battery here is more of a secondary feature than a main selling point. There is the option to switch to the rechargeable battery for “outdoor activities”, but there is the wired system for indoor use. This also means that this isn’t the portable model that some buyers may be looking for. It is larger and heavier at 41lbs. There is a still a telescoping handle and wheels, however, for relocation into that outdoor setting. 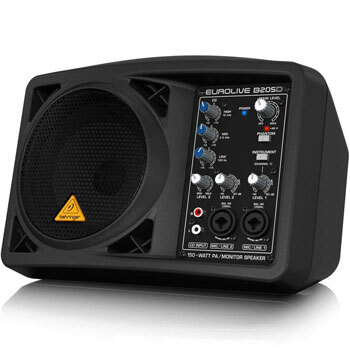 The PRORECK PA system has an 800w speaker, 15’’ woofer and a range of inputs. Therefore, there is enough power here for larger gigs and a broader set-up. Users can play with the equalizer, echo and more on different microphones and instruments. 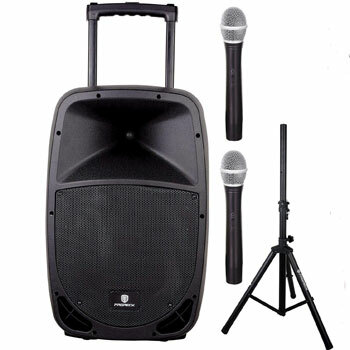 Choosing the right best wireless PA sound system for your needs. There are clearly lots of different types of wireless PA system out there. Some place minimal emphasis on the battery and use it as a secondary feature, while others are deliberate attempts at providing portable power for outdoor applications. Some models are surprisingly powerful and diverse, with good battery lives. Others are a little weaker and more for basic entertainment than gigs or speeches. It it important to read and compare specifications carefully to find the device that best suits the intended purpose.